If you or a family member has been injured and are being offered a cash settlement, it may make sense to accept it. However, depending on your individual situation, signing away future benefit and rights in exchange for a lump sum could be disastrous. Even though the amount may seem large, initial settlement offers are usually far less than you need for your injury. Once you enter a settlement, or sign anything from your employer or an insurance company, it may be difficult or impossible to reverse your decision. Always consult an attorney before surrendering your rights with a signature. The Miami workers' compensation attorneys at Friedman, Rodman, & Frank can help you make an informed decision that’s right for you and your family. If you’ve been injured, you may be offered a lump sum settlement in exchange for your lost wages, your medical expenses, or both. However, you will waive your rights to additional claims and future benefits that could arise as a result of your injury, and a lump sum may not adequately account for future medical needs and wage losses. Even if your future medical expenses exceed the amount of your settlement, you won’t be able to collect more money to cover those costs. The alternative is a structured settlement, where you receive some compensation now and the rest over time. Typically a structured settlement is more expensive for an insurance company in the long run, so they are eager to have you accept a lump sum. However, there are advantages and disadvantages to taking a lump sum settlement, and it’s important that you understand both and choose the action that’s right for you. Settling your claim generates an immediate payment, rather than spreading the benefits over years. You will not facing restrictions on returning to work or earning levels. Often, benefits are reduced based on your income. You don’t have to take defensive medical exams to prove your disability. Your family with have the money if you die, rather than benefits that end with your death. The offer may not be adequate to meet your needs for the rest of your life. Many lump sum settlements are gone in a few years, leaving you to cover any future costs. Even if you save or invest your settlement, the amount is vulnerable to market fluctuations and other risks. What is the lump sum offer and is it acceptable based on your current claim? What is the value of a structured settlement? Could your medical condition grow worse, and does the offer adequately compensate you for that? Can you return to work, and should you? Choosing whether or not to accept a lump sum settlement is a complex decision, with a number of issues at stake, and your decision is binding. Making the wrong choice may cause you to lose the full amount of benefits you deserve for your injury. 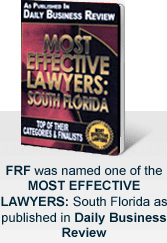 The highly experienced Miami workers' compensation lawyers at Friedman, Rodman, & Frank can help you review your settlement offer and create a compensation plan that meets your needs. For a free consultation in English, Spanish, or Creole, contact our Miami/South Florida offices at 305-448-8585 or toll free at 877-448-8585, or fill out our online contact form.